With the new Mac Pro’s “selective” hard drive situation, we wanted to check with Akitio at Cinegear 2014 as we knew they had a number of Thunderbolt enabled solutions that would work well with the new computer. So we talked with Akitio’s Richard Wright about a number of their drives. The first product Wright showed us is their popular Thunder Dock. It has a thunderbolt connection as well as a second for daisy chaning, two eSATA ports, one Firewire port, and two USB3 ports. Wright notes that the Thunder Dock is for those who have “a lot of older, legacy products and they bought the newest Mac, there’s no way to connect anything but Thunderbolt and USB”. The Thunder Dock will allow you to bridge the gap between the products you’ve spent years and money collecting and the new Mac Pro, allowing you the freedom to continue using both. The Thunder Dock is available now for $269, and is available on Amazon, B&H, Adorama, and many other dealers. The Neutrino Thunder D3 is a two bay storage unit that comes in two models: one with a USB3 port and Thunderbolt port, and another with two Thunderbolt ports. Wright points out the the Neutrino Thunder D3 is sold both by itself and bundled with drives, so that you have the option of using their drives or any other hard drive you wish. We also asked about editing directly off the drive given the upswing in SSD recording. Wright confirmed that it is a simple process to just record to the drive, place the drive in their product and begin editing, no file transfers required. The Neutrino Thunder D3 is available now for $299 and is available on Amazon, B&H, Adorama, and many other dealers. 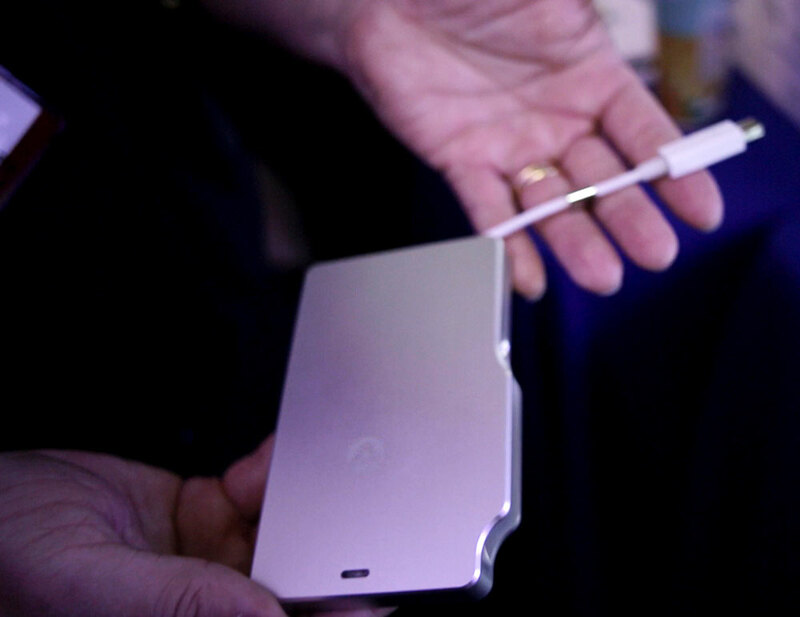 The one bay version of the above product, the Neutrino – Thunderbolt Edition functions similarly to the above but only holds one drive. Wright points out that Akitio is the only manufacturer that currently offers a 512GB version, compared to the rest of their competitors only offering up to 256GB with their products. 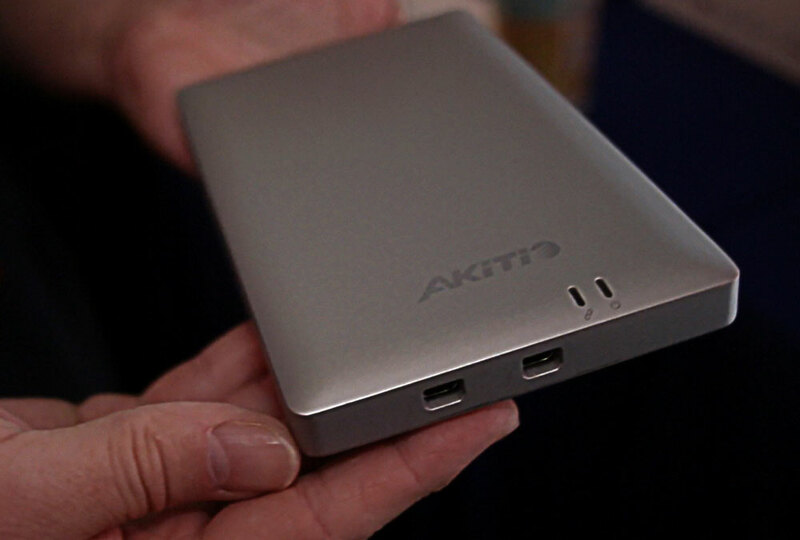 He even notes that Akitio is looking to take that further and provide a 1TB SSD version as well. All of this is BusPowerd, meaning no external power required. The Neutrino – Thunderbolt Edition is available now for $249 and is available on Amazon, B&H, Adorama, and many other dealers. The Palm Raid is is a smaller drive with a tethered cable along the side that holds two mSATA SSDs inside. Wright points out that these SSDs can be used in RAID 0 and RAID 1 and comes in up to a 512GB version. The Palm Raid has a USB3 port with about 420MB/s transfer speeds. The Akitio Palm Raid is available now for $649 and is available on Amazon, B&H, Adorama, and many other dealers.